As a cheese lover, I love everything topped with golden oozing cheese. Moussaka, a popular Greek dish, is one of them. You know the traditional moussaka would have layers of eggplants and potato with ground lamb or beef in between. Our keto-friendly version is much easier to make and tastes just as good. 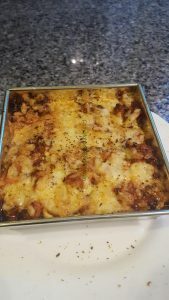 Moussaka makes a great low carb, high fat meal because we only use eggplants and it’s loaded with lots of cheese. In this recipe, we use our own Bolognese sauce but you can use whatever leftover meat you have. All you have to do is season it with some garlic and onion powder, herbs of your choice and tomato paste. Right where we live here, there is a local market where I can get fresh picked vegetables. The other day I happened to find Japanese eggplants, the long thin purple variety and I got the idea that I could use it in my moussaka. You can use your regular eggplants which is probably easier to handle. I sliced mine about 1/2 cm thick and soak in water for 20 mins then boil till soft and drained. .
Then proceed with layering your moussaka with eggplants and sauce alternately. Then top with grated mozzarella and bake till top is golden. The combination of tomato meat sauce and hot melted cheese is to die for. Prepare Bolognaise sauce. If you want to make your own sauce from leftover meat, just chop your meat roughly. With a tablespoon of olive oil, sautéed it and add garlic, onion powder and herbs of your choice. Add 2 tbs tomato paste, mix well and you are done. Slice eggplants to 1/2 - 3/4 cm. thick and soak in water for at least 20 mins. Put a pot of water to boil, drain the eggplants and put to boil till soft. Then put in a colander to drain. 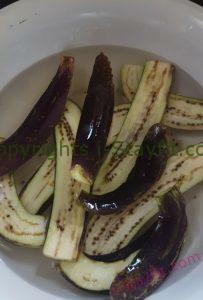 Arrange boiled eggplant strips to cover the sauce. Repeat with another layer of sauce and eggplant then top it with the remaining sauce. 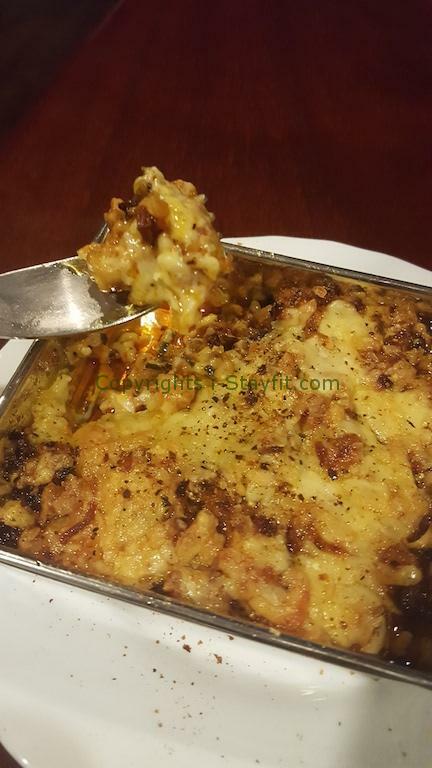 Sprinkle the cheese on top and bake at 180 ˚C for 20 mins or till the top is melted and turn golden brown. We use 2 small baking tray for individual serving. Ramekin dishes work fine too but you will probably need to put in a few layers to fill it up. We have used a loaf tin which is the easiest option. Then you cut the moussaka in half to serve.